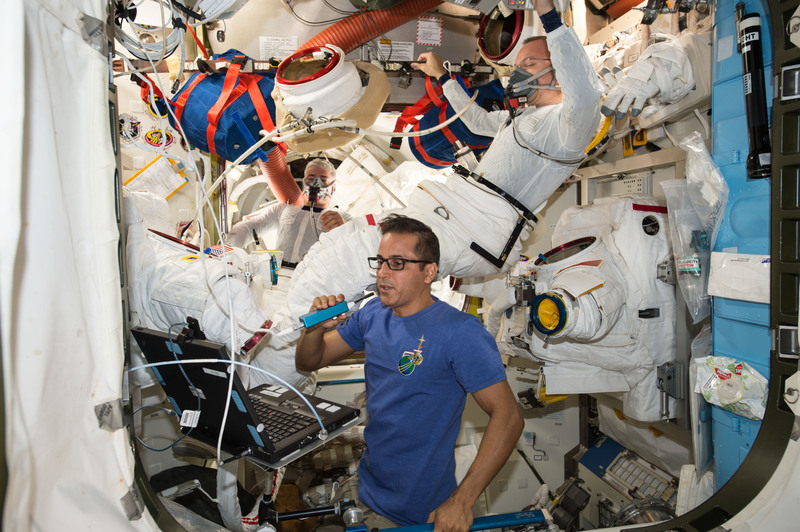 After a trio of spacewalks this month, including the final one conducted last Friday by Commander Randy Bresnik and Flight Engineer Joe Acaba of NASA, the Expedition 53 crew returned to a schedule of full-time science this week. 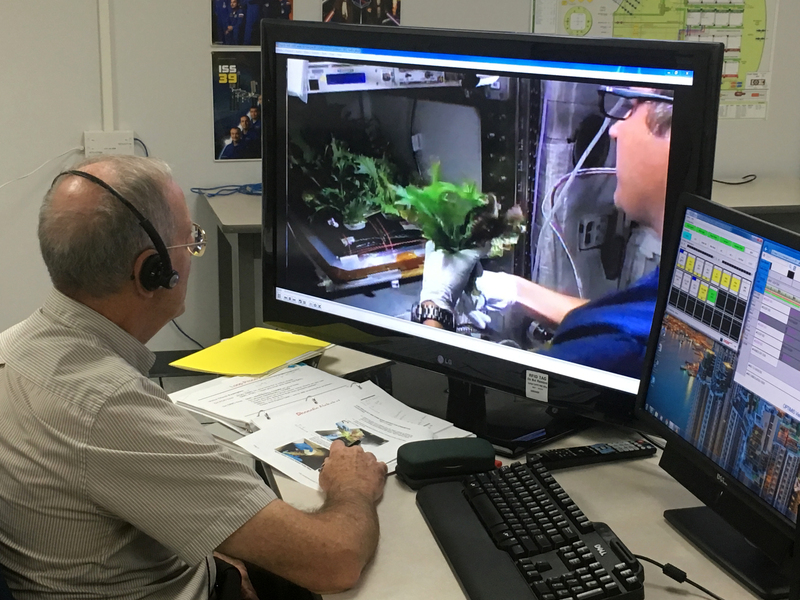 Today, the crew explored how lighting aboard the International Space Station affects their performance and health. One such investigation is called Lighting Effects, which studies the impact of the change from fluorescent light bulbs to LEDs. By adjusting intensity and color, investigators on the ground will use crew feedback to determine if new lights can improve crew circadian rhythms, sleep and cognitive performance. Blood and urine samples were also collected and stowed in the Minus Eighty Degree Celsius Laboratory Freezer for ISS, or MELFI, marking Flight Day 30 for the Biochemical Profile and Repository experiments. Specific proteins and chemicals in the samples are used as biomarkers, or indicators of health. Armed with a database of test results, scientists can learn more about how spaceflight changes the human body and protect future astronauts on a journey to Mars based on their findings. Expedition 53 is also preparing a microsatellite carrying an optical imaging system payload for deployment. 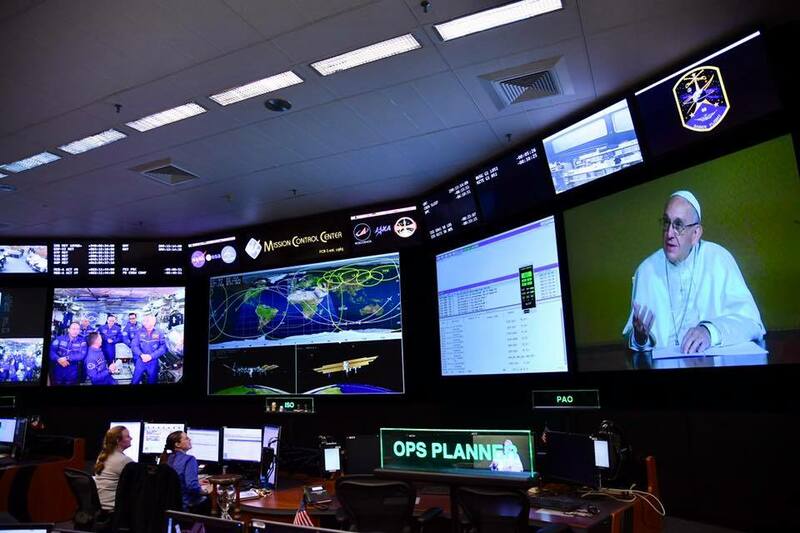 Its operation in low-Earth orbit will attempt to solidify the concept that these small satellites are viable investigative platforms that can support critical operations and host advanced payloads. Astronaut Joe Acaba (foreground) assisted crewmates Randy Bresnik (right) and Mark Vande Hei before they began a spacewalk on Oct. 10. Four Expedition 53 crewmates huddled together and made final preparations the day before the third and final spacewalk planned for October. Meanwhile, NASA’s commercial partner Orbital ATK has announced Nov. 11 as the new launch date for its Cygnus cargo carrier to the International Space Station. 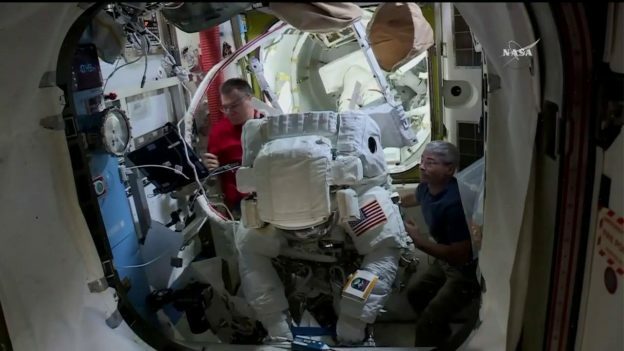 Commander Randy Bresnik and Flight Engineer Joe Acaba are reviewing procedures and configuring tools before their spacewalk set for Friday at 8:05 a.m. EDT. 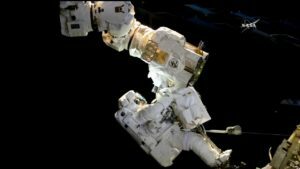 NASA astronaut Mark Vande Hei and Paolo Nespoli from the European Space Agency will assist the spacewalkers in and out of their spacesuits and guide the duo as they work outside. The spacewalk was originally set for Wednesday before mission managers replanned a new set of tasks due to a camera light failure. 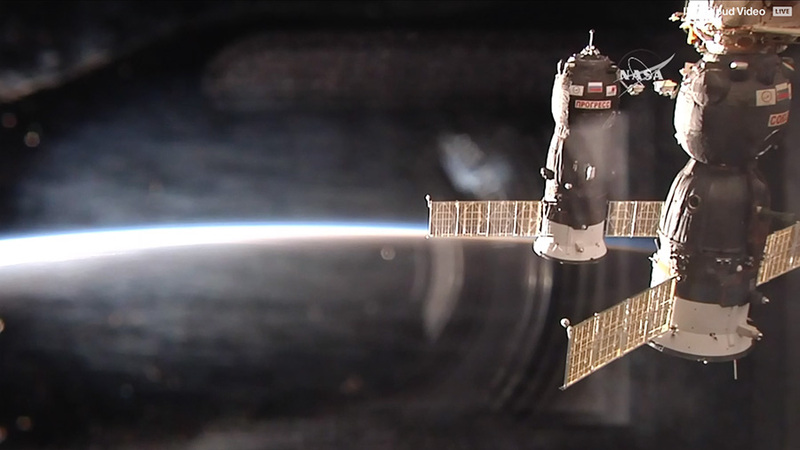 Bresnik and Acaba will now replace the camera light assembly on the Canadarm2’s newly installed Latching End Effector and install an HD camera on the starboard truss. The duo will also replace a fuse on Dextre’s payload platform and remove thermal insulation on two electrical spare parts housed on stowage platforms. Orbital ATK is targeting the launch of its eighth Cygnus resupply mission to the station for Nov. 11. Cygnus will make a nine-minute ascent to space after launch, then begin a two-day trek to the station where it will be installed for a month-long stay after its capture by the Canadarm2. 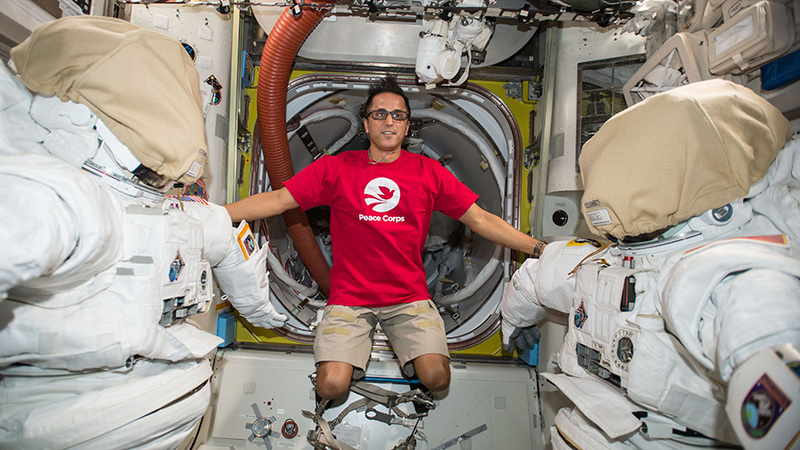 Astronaut Joe Acaba poses in between two U.S. spacesuits inside the Quest airlock. He will wear one of those spacesuits on a spacewalk scheduled for Oct. 20, 2017. The Expedition 53 crew trained for a medical emergency in space today after spending the morning on weekly housecleaning tasks. Afterward, two astronauts reviewed procedures and checked their tools ahead of Friday’s spacewalk. 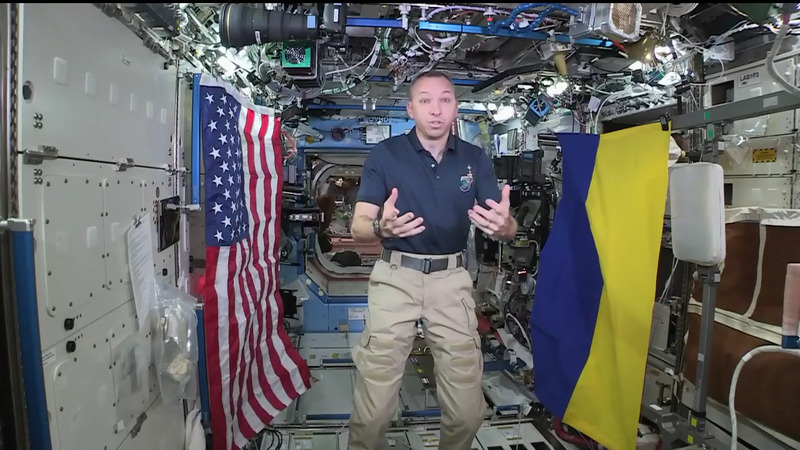 Cosmonaut Alexander Misurkin joined NASA astronauts Mark Vande Hei and Joe Acaba for a routine training session to handle a medical emergency aboard the International Space Station. The trio reviewed medical hardware, chest compression techniques and individual roles and responsibilities. Afterward, Acaba moved on to spacewalk preparations with Commander Randy Bresnik. 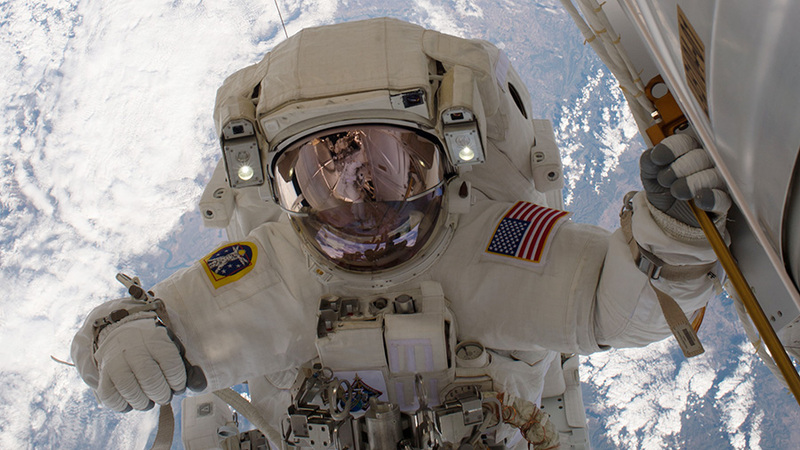 The spacewalkers are due to begin a 6.5 hour spacewalk Friday at 8:05 a.m. EDT. 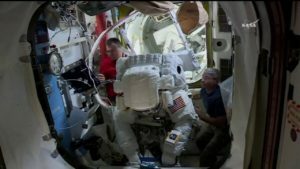 NASA TV will cover the spacewalking activities live beginning at 6:30 a.m. This will be the third spacewalk this month and consists of repackaged tasks that include the replacement of a camera assembly on the newly installed Latching End Effector, the installation of an HD camera on the starboard truss, the replacement of a fuse on Dextre’s payload platform and the removal of thermal insulation on two electrical spare parts housed on stowage platforms. Astronaut Mark Vande Hei is pictured tethered to the outside of the U.S. Destiny laboratory module during a spacewalk on Oct. 10, 2017. Two NASA astronauts are getting ready to go on their mission’s third spacewalk on Friday. In the midst of those preparations, the Expedition 53 crew also worked on science gear exploring a wide variety of space phenomena. Commander Randy Bresnik is preparing to go on the third spacewalk this month with NASA astronaut Joe Acaba. Astronauts Paolo Nespoli and Mark Vande Hei will assist the spacewalking duo in and out of their spacesuits on Friday. The spacewalkers will replace a camera light on the Canadarm2’s newly-installed Latching End Effector and install a high-definition camera on the starboard truss. 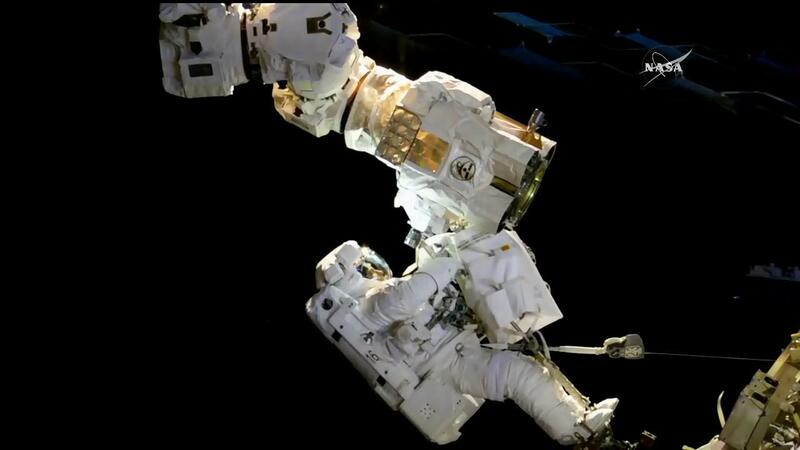 Other tasks include the replacement of a fuse on Dextre’s payload platform and the removal of thermal insulation on two electrical spare parts housed on stowage platforms. 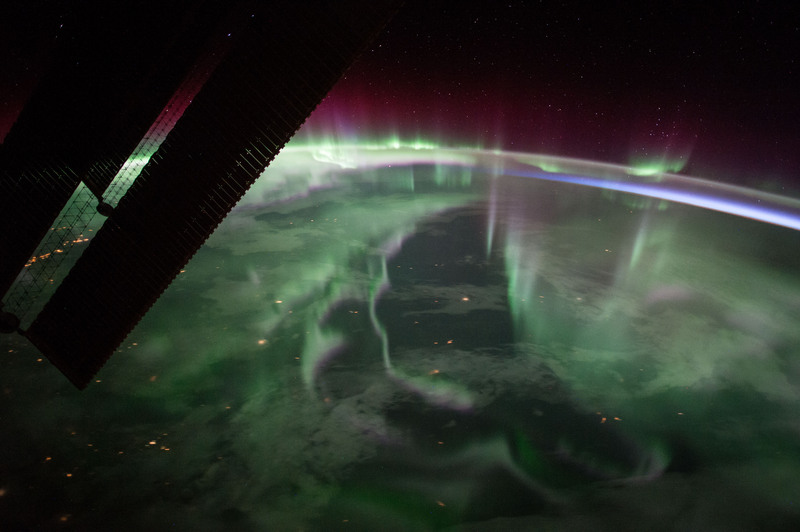 Bresnik started his day working on a specialized camera that photograph’s meteors entering the Earth’s atmosphere. Acaba finally wrapped up the day configuring a microscope inside the Fluids Integrated Rack. Nespoli, from the European Space Agency, set up the new Mini-Exercise Device-2 (MED-2) for a workout session today. Researchers are exploring the MED-2 for its ability to provide effective workouts while maximizing space aboard a spacecraft.